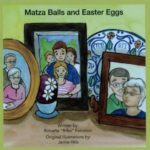 This is a book for children from intercultural families who celebrate both Passover and Easter. It is a book created to make children feel comfortable with two cultures in their home. The illustrations are large and designed to capture the attention of young children. The words are simple to understand. There is a glossary of the Yiddish terms that are used in the book. $5.95 Click here for the sales-sheet. Highly readable, well-organized information on Rosh Hashana and Yom Kippur. Provides history, readings, and songs for inclusion in Secular Humanistic New Year Celebrations. A 1990 favorite revised. This booklet explains most Jewish holidays from a secular viewpoint. By Hershl Hartman and Jeffrey Kaye, ed. For youngsters (5th grade and up) who want to know the “why” of everything. Kids who are Jewish, part-Jewish (and their families) appreciate the historical and multicultural approach to the “December Dilemma”. For young and old alike…stories by the Yiddish masters. A compendium of writings by Secular Humanistic Jews.